HDB flats resale prices increased by 0.1 per cent in the 2nd Quarter of 2018. This increase is the first rise after nine months of continuous decline. The hike – though only incremental – may indicate that HDB resale prices are bottoming out. The Housing & Development Board’s data also showed that HDB resale transactions rose 33.3 per cent from 4,458 cases in Quarter 1 to 5,941 in Quarter 2. HDB’s data on Median Resale Prices by Town and Flat Type for Resale Cases Registered in 2nd Quarter 2018 showed that flats in Central area commanded the highest prices. The average price for 4-room flats in the area was $870,000. HDB flats resale prices for 4-room flats in Queenstown followed the prices of flats in Central area very closely, with the average price registering at $738,000. 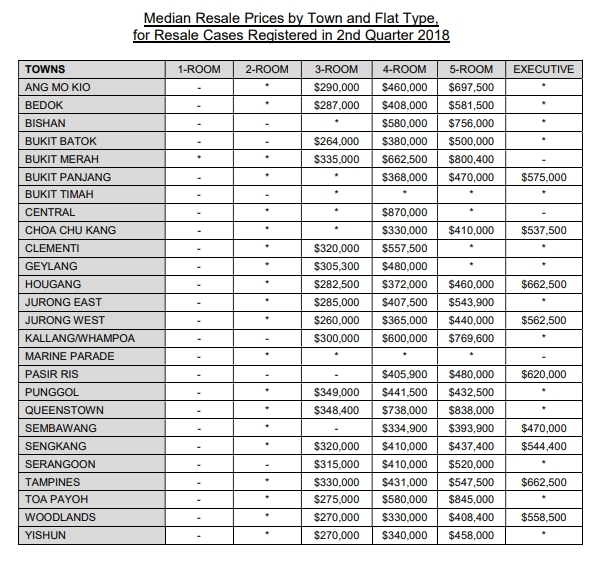 4-Room flats in Bukit Merah registered at $662,500, and came in at third highest priced area in the list. Lowest average prices for HDB resale flats were logged for the areas of Woodlands and Choa Chu Kang. HDB’s data showed that the average price for both areas was $330,000. Some real estate market observers have suggested that the HDB resale market will get a boost from the recently announced property cooling measures. “In fact for some of these buyers they may then swing over to the HDB resale market, because the curbs are not put on to the HDB market at all,” he added. Lesser flats are identified for SERS over the years – what’s the solution for aging HDB flats? ERA’s key executive officer, Eugene Lim, echoed Ku and said that with the new property cooling measures in place, home hunters with tighter budgets as well as en bloc owners would turn to the HDB resale market, where properties are cheaper. “Resale flats remain the only way for buyers to pick a flat in a location of choice, and unlike BTO flats, the eligibility conditions are far less stringent; especially if the buyer is not applying for CPF Housing Grants; or not taking a home loan through the HDB,” he noted. Christine Sun, Orange Tee & Tie’s head of research and consultancy said the strong demand for resale HDB flats may be “supply-driven as more units had been completed in recent years and being put up for resale after they reached the five year MOP (minimum occupation period)”. The relatively large supply of Built-To-Order (BTO) flats coming onboard this year though, could partially dampen the quick rise of HDB flats resale prices. HDB said that it will build 16,000 BTO flats this year. This figure is 1,000 less than the numbers projected by HDB earlier in the year. HDB adjusts its supply of BTO flats from time to time, depending on market conditions. “As the HDB resale market continues to stabilise, HDB will reduce the supply of BTO flats in 2018 slightly,” the board said in a statement. HDB will offer 4,300 BTO flats in Punggol and Yishun in August. Aside from the new flats, a Re-Offer of Balance Flats exercise will also be held. Nicholas Mak, ZACD Group’s executive director suggested that the reduction in BTO flats may contribute to a slight increase in HDB resale prices. He noted that the recent decline in HDB flats resale prices has been partially attributed to HDB’s large supply of BTO flats; and suggested that with a smaller supply of new flats for the rest of this year, HDB flats resale prices might stabilise further and even inch up marginally. The numbers for HDB flats being rented out also looks healthy. The number of approved applications to rent out HDB increased 2.6 percent to 12,024 in Q2 2018 from 11,721 during the previous quarter, HDB data showed. 23,745 units were rented out in the 1st half of 2018. This is an increase of 13.6 percent from the 20,910 units rented out in the first half of 2017. Are planning to purchase a HDB resale flat but unsure of the funds you have? Don’t worry because iCompareLoan mortgage brokers can set you up on a path that can get you a home loan in a quick and seamless manner. Next articleCould Solar Energy Make Your Electricity Bill Cheaper?